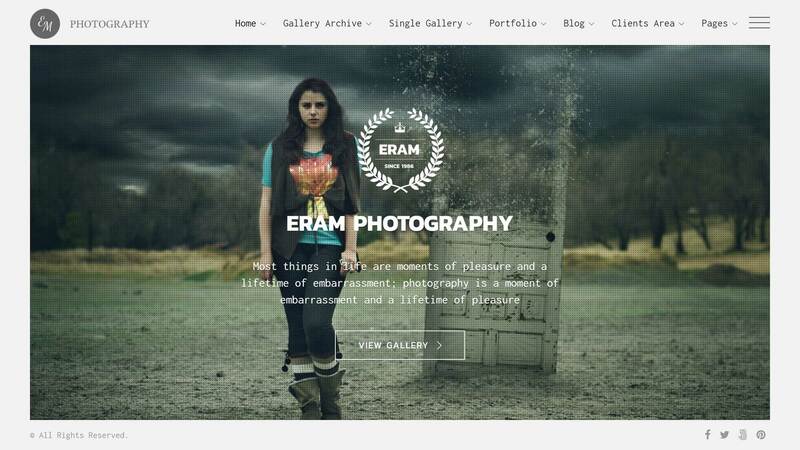 Eram is a versatile WordPress theme for any type of photography-related website. From portfolios for hobbyist photographers to websites for those offering professional photography services, Eram can help you build an effective website. 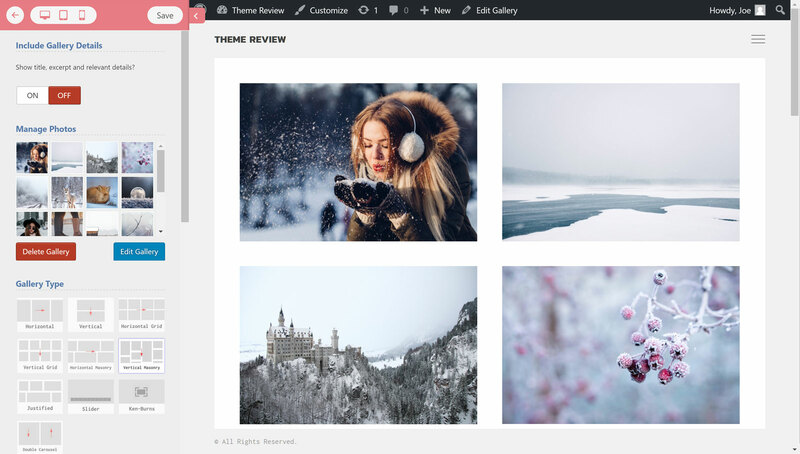 With so many options available in this category, the goal of this Eram theme review is to help you decide if this is the right WordPress photography theme for your website. 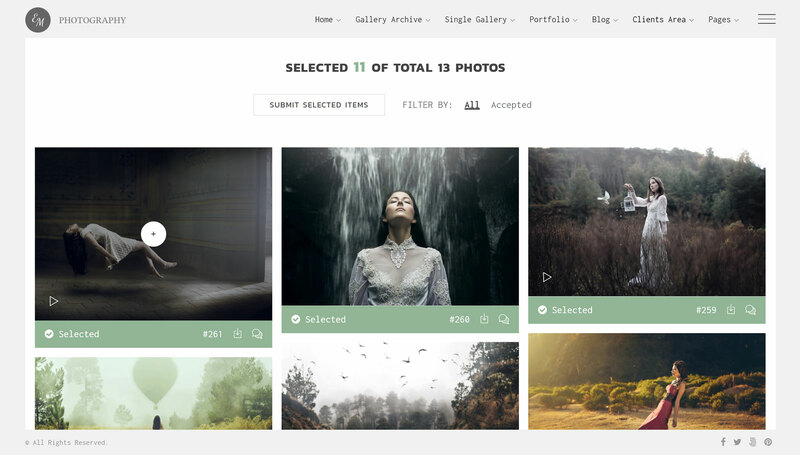 Who Should Choose the Eram Photography Theme? 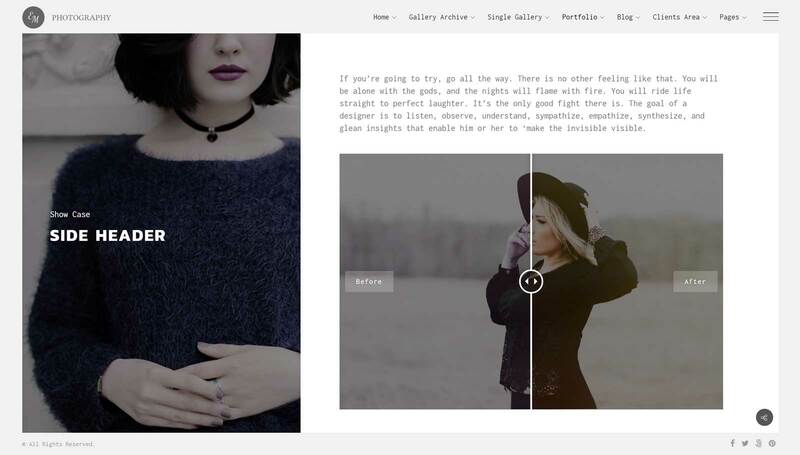 As mentioned, this is a photography WordPress theme. 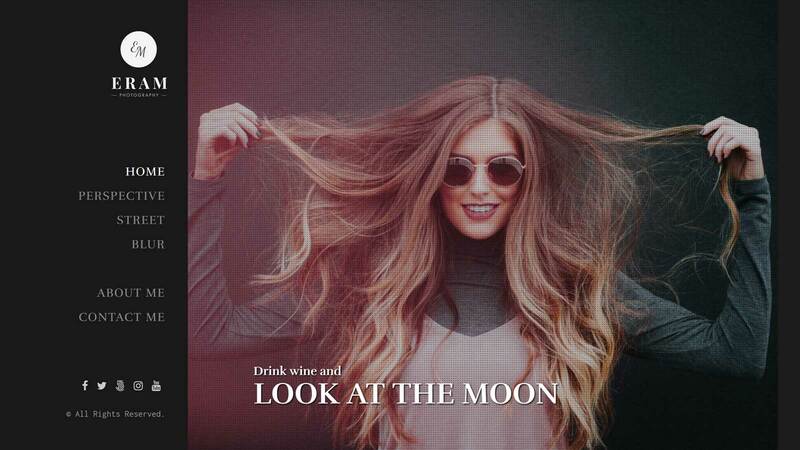 Therefore, if you want to create a stylish website to display your photos, this could be the theme for you. However, as Eram has a good amount of features that professional photographers would find useful, it’s an especially good choice for anyone who wants to grow their photography business. Some of the most impressive features of Eram are its tools to help you work more efficiently with your clients. However, thanks to Eram’s high-quality design, attracting new clients shouldn’t be a problem with this theme either. Eram is also packed with customization options and tools to help you craft the perfect design for your photography website. If you’re a professional photographer who works with clients, Eram has a number of features that should be of interest. One of these features gives you the ability to quickly create a page or area on your site for each client. You can then upload client photos to this area, allowing them to check and view your work. For security purposes, this content can be password protected to ensure only you and a particular client can see it. 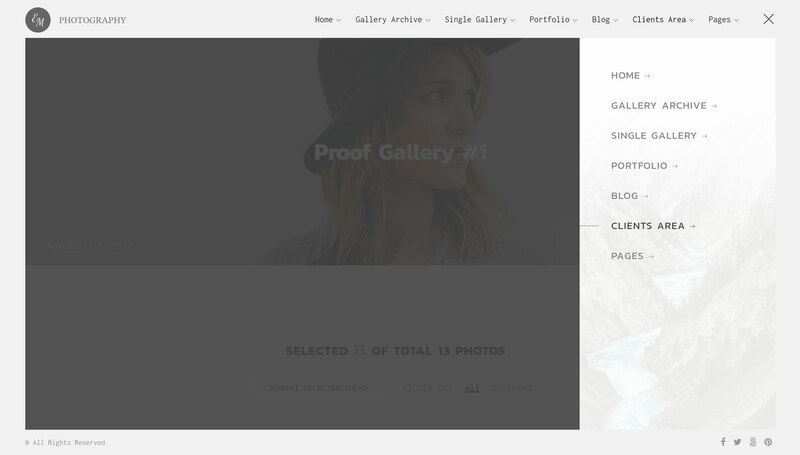 Another useful Eram theme feature is the ability to create proof galleries. This gives you the opportunity to upload work for your clients to approve. By taking care of the proofing gallery functionality for you, Eram prevents you from having to invest in and set up an additional service. Clients can then submit their confirmation of your work, with email notifications automatically sent out to keep everyone in the loop. No matter what type of photography website you want to create, Eram could be a good choice. Thanks to the varied selection of photography demos, creating anything from a personal portfolio to a range of websites for professional studios is possible with Eram. Selling photographs online from your website is also one of the jobs Eram was built to do. But is your project covered by the Eram theme demos? Let’s find out in this section of our Eram theme review. The main Eram demo could be considered a general-purpose photography website demo. Whether you just want a stylish home for your photographs or a way to attract new clients, this demo could be for you. 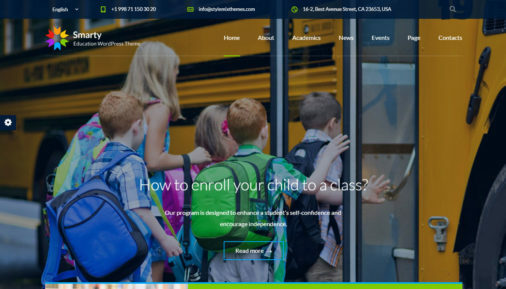 The homepage slider is perfect for showcasing your best photographs and videos, as well as displaying links to content on your website such as portfolio items, blog posts, or your services page. 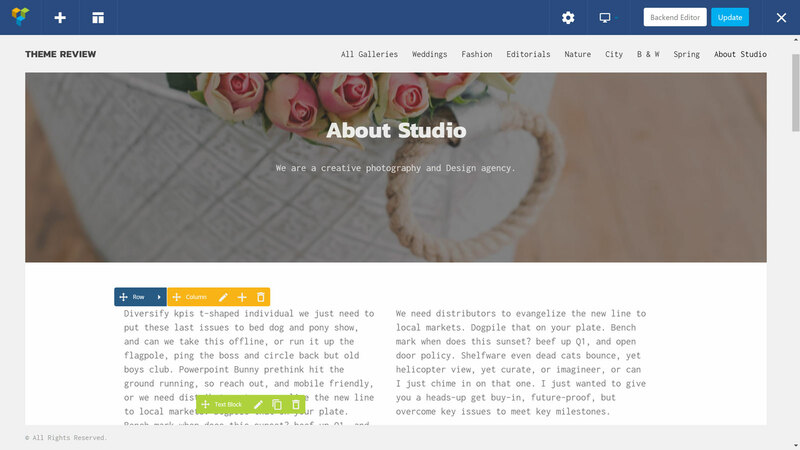 Eram has a few different demos for creating photography studio websites. However, the Ceremony Studio demo is one of the best options. 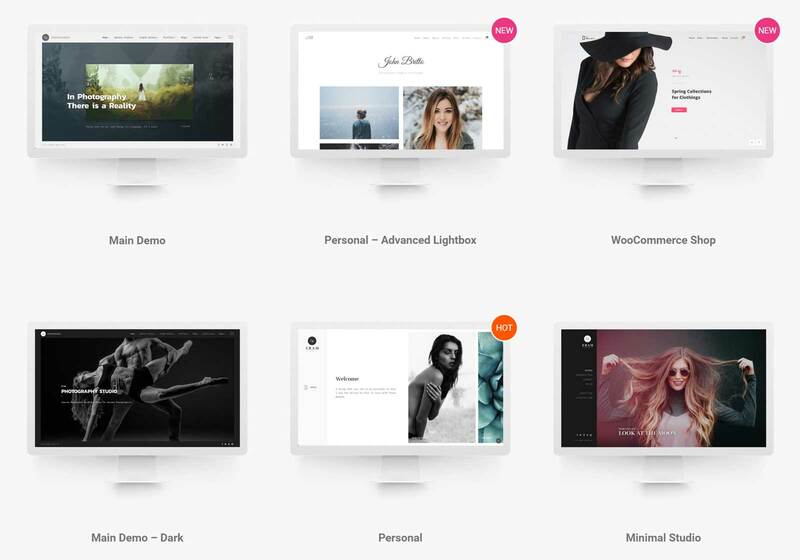 If you choose this demo for your website, you’ll be able to present your work in style, while also promoting your studio to new customers and clients. 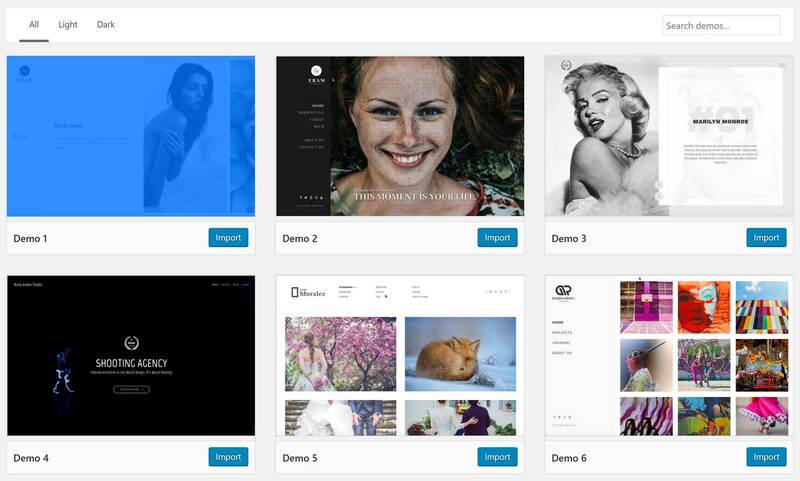 All the best Eram portfolio templates are available to you with this studio demo. If you’re creating a personal photography portfolio website, then Eram has multiple suitable demos to choose from. This option is a good choice, thanks to the lightbox photo viewer tool. You can also organize and categorize your photos to make it easier for visitors to find the type of shots they’re looking for. There’s also a stylish services page template that should help you find more people to work with. Thanks to the selection of agency and studio demos, creating a website for your photography business is easy with Eram. 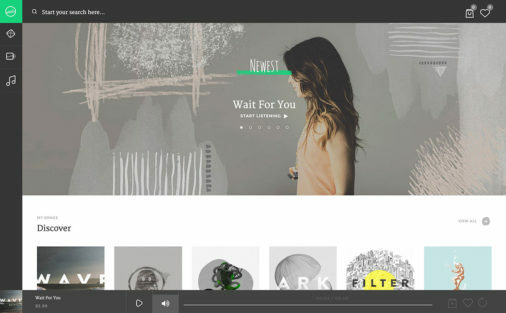 With this agency demo, you get a stylish homepage design to make use of. You’ll also find a creative gallery layout for displaying your photos. Publishing the essential information about your studio or agency isn’t a problem either. Any website created with Eram has the ability to sell items online. However, there is one purpose built Eram ecommerce demo that is ideal for websites that are primarily focused on selling products or prints online. 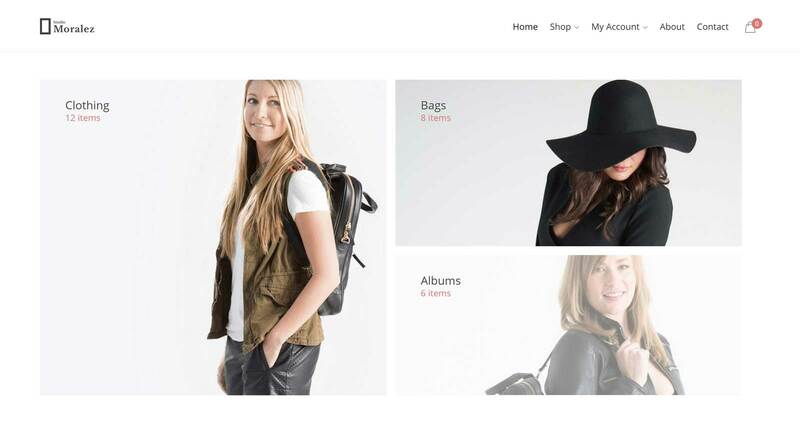 With the Eram WooCommerce demo, you can create a fully featured online shop. Whether you want to sell photographs or photography accessories and related products, this demo makes it relatively simple. You can view the rest of the photography demos on the Eram theme website. 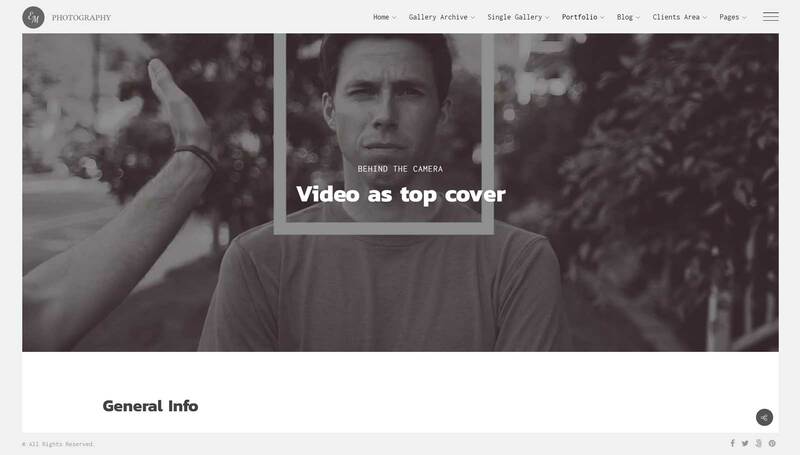 Thanks to all the impressive photography website demos, you should be able to launch a professional website with Eram. Even if you’re new to WordPress or web design in general, getting started with Eram is straightforward. Importing the demo content only takes a few clicks, leaving you more time to work on customizing your website or servicing your clients. Simply choose the demo you want to recreate on your WordPress website and click the import button. The process will take a minute or so and you should have the foundations for your photography website in place, leaving you to add your own content. As well as the homepage and website demos, Eram has a good selection of templates and layouts for the inner pages of your site. Thanks to this, creating your online photography portfolio with WordPress shouldn’t take you much time. In fact, regardless of which demo you choose, you’ll have a range of options for publishing your online portfolio. 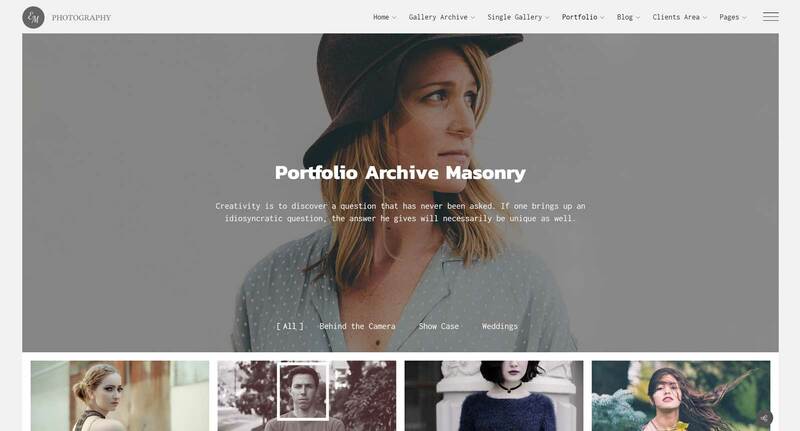 Masonry layouts, grid designs, and infinite scroll are just some of the options you can choose from to publish your photos online. Your portfolio content can easily be filtered, thanks to the tagging and classification features. 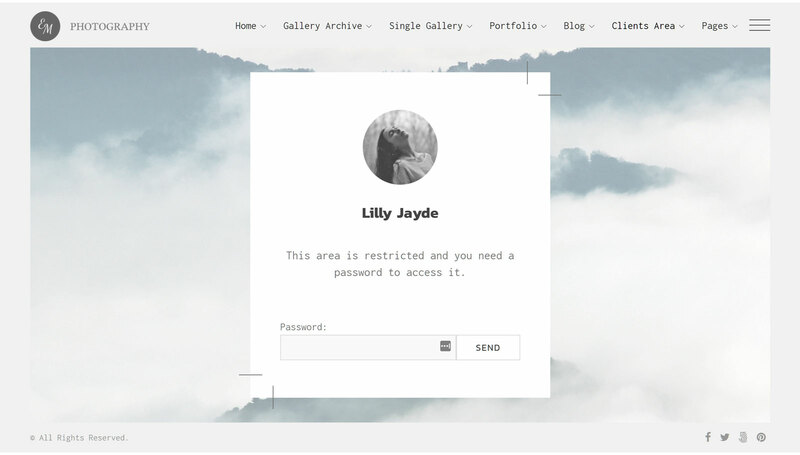 You can also create custom layouts for your portfolio items. Adding videos alongside your photographs is easy too. Blogging can be a great way to connect with your target audience and bring more traffic to your website. 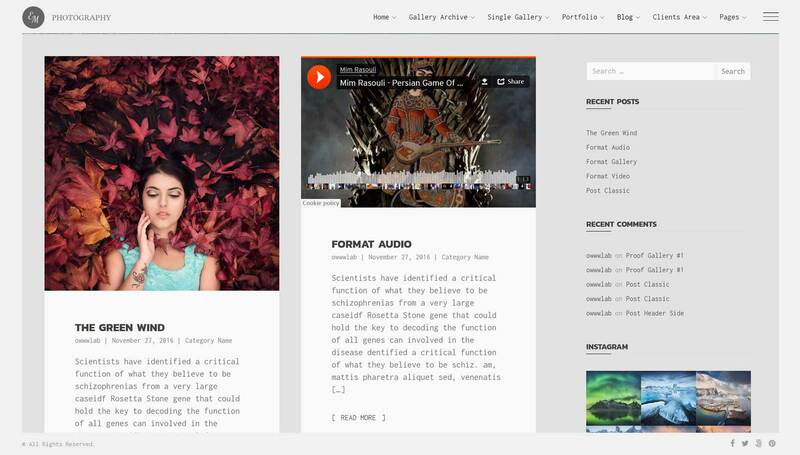 Thankfully, Eram has a varied selection of blog layouts and templates. 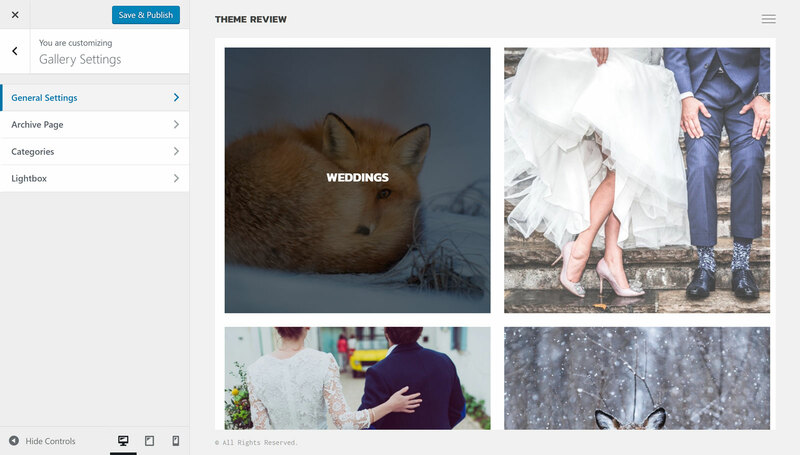 This makes it easy to add a blog to your photography website and start publishing new content. Some uses for your blog could include sharing photography tips, reviewing photography gear, and publishing your latest news. 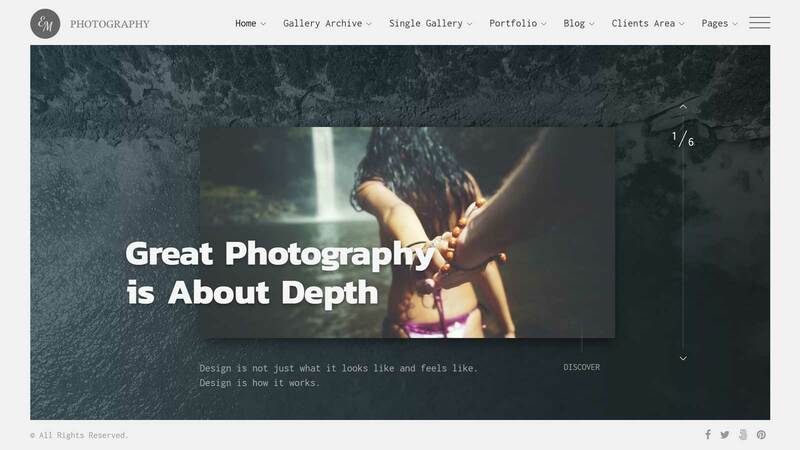 As you’d expect from a professional photography WordPress theme, there are plenty of gallery templates to work with. 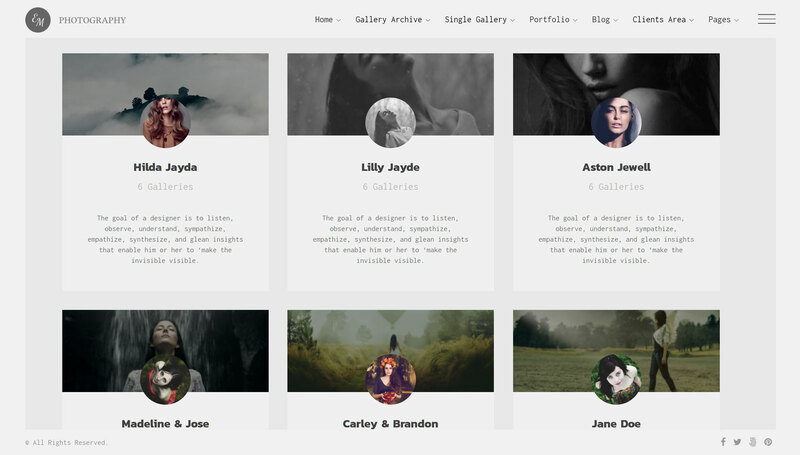 The double slider gallery layout is a particularly interesting option that could help impress your visitors. Eram isn’t just about flashy designs and templates. 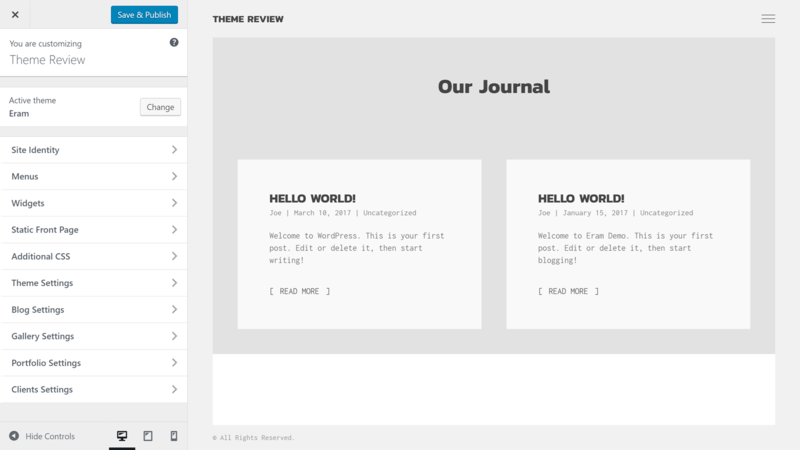 This theme is focused on being functional and easy to use as well as stylish. Clicking through to an individual gallery delivers a user-friendly experience. No matter the technical abilities of your visitors, they shouldn’t have a problem navigating your site and viewing your work. How ever you want to present your work online, there should be an Eram template or layout to match. Although the Eram galleries look great, it’s important to establish how easy they are to set up. After all, if it’s too difficult or time-consuming to add content to your online portfolio, it doesn’t matter how good the design is. Thankfully, it shouldn’t take you long to get the hang of adding your photos to your website with Eram. 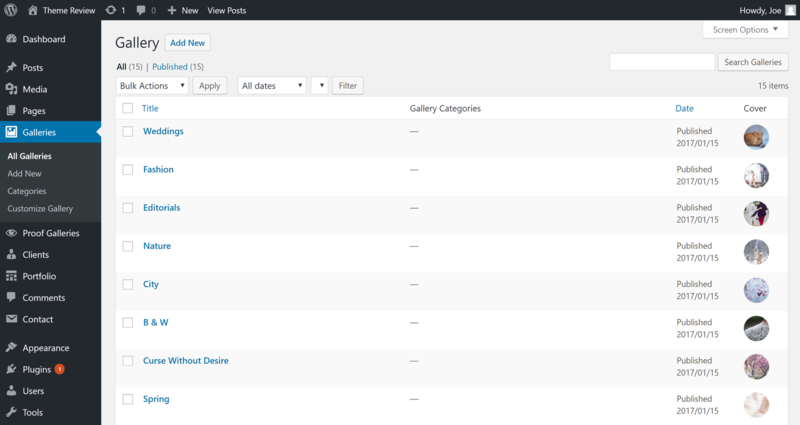 Eram uses WordPress custom post types to manage the gallery and other types of content on your website. If you import the demo content, you’ll get a good idea of how this works. Once you create a new gallery with Eram, you can add a cover image, before customizing the overall design. The Eram gallery builder features a user-friendly interface that gives you the ability to choose from a range of gallery styles and layouts. 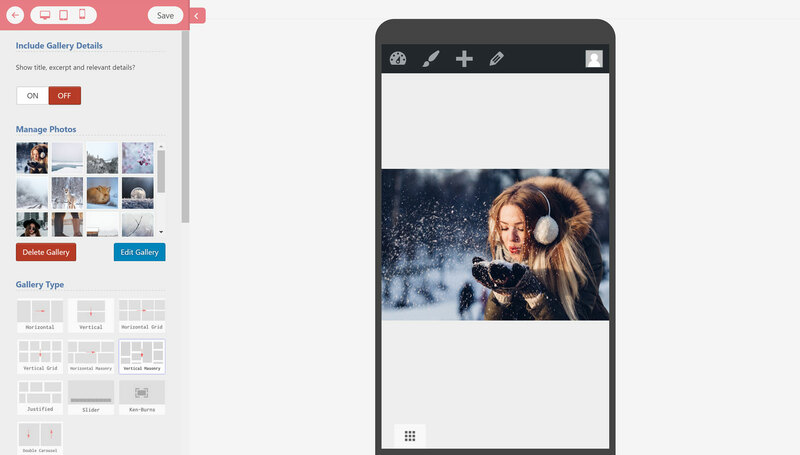 The gallery builder has many options to work with, including enabling lazy loading, infinite scroll, lightbox sliders, items spacing, and social share buttons. The Eram gallery builder tool gives you a quick and easy way to test your content for mobile and tablet users. Now there’s no chance you’ll be turning away the growing number of internet users who access websites on smartphones or other small screen devices. As each gallery can have its own custom design, you can create the perfect layout for each set of photographs you’re publishing with Eram. As well as the intuitive gallery builder tool, Eram also includes a drag-and-drop page builder tool. With the premium Visual Composer plugin at your disposal, you’ll be able to create custom designs for any piece of content on your website, including the homepage. With Visual Composer, each time you open a page for editing, you’ll have the option of firing up the drag-and-drop page builder and creating a custom design. 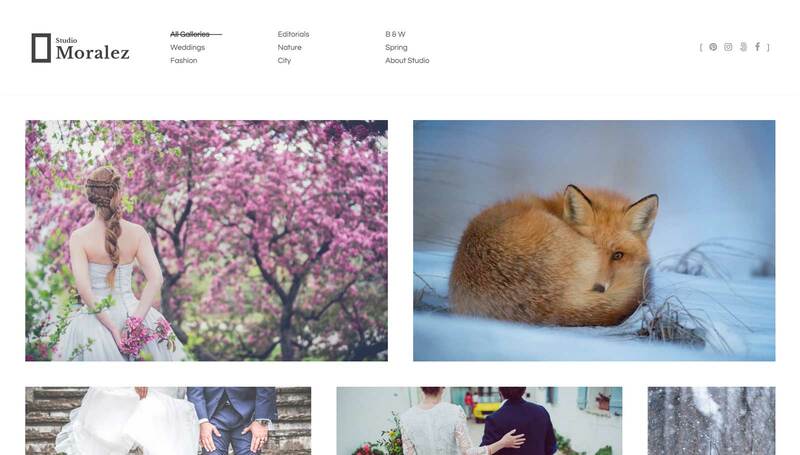 Now you can create custom page layouts, with multiple rows and columns. 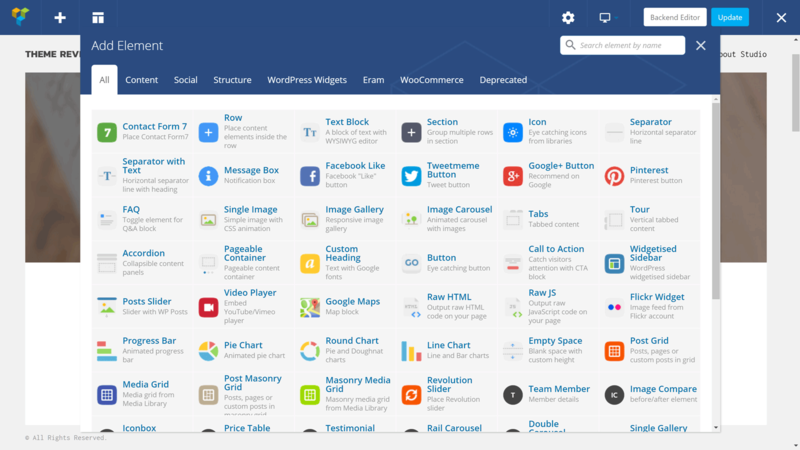 You can then populate those layouts with items from the Visual Composer library of elements. Although Visual Composer gives you a wealth of new elements to add to your pages, there’s a few that photographers should appreciate. Some of these photographer-friendly elements include the media grid builder, the image carousel, the Flickr widget, carousel display, and before and after effects comparison tool. While Visual Composer makes it easy to customize the individual page layouts of your site, you also have the option of making global changes to your website with Eram. This work takes places through the WordPress Customizer interface, an intuitive way to personal many aspects of your website. After activating the Eram theme on your WordPress website, you can access the control panel to start setting up your website. As well as enabling the integrated plugins, you can also import the demo content. Once those tasks are complete, you can move onto customizing your new WordPress photography website. Switching to the Customizer view displays the controls and settings available to you. With Eram, you get a good amount of control over the appearance of your website. 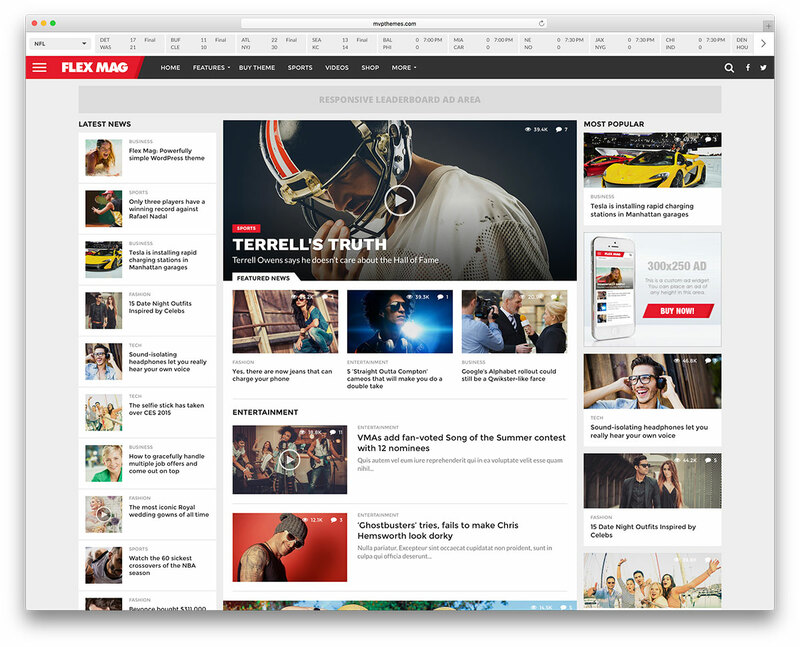 This includes the overall site layout, the header styles, site colors, typography settings, and more. You can also set which content is displayed on the homepage of your site, how your menus are organized, and which widgets are active in your sidebar areas. You can also use the user-friendly customizer interface to personalize the appearance of your site. This includes the gallery, portfolio, and blog areas. While you’re working, you can easily get a preview of how your site will look on smartphones and tablets for maximum compatibility. 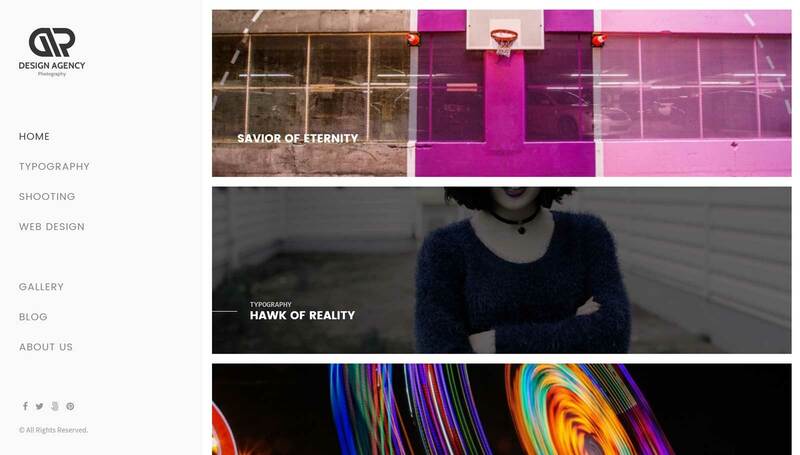 Slider Revolution premium slideshow builder tool. Support for embedding YouTube and Vimeo videos. Automatic theme updates are are coming soon. You can view the full feature list on the Eram theme website. 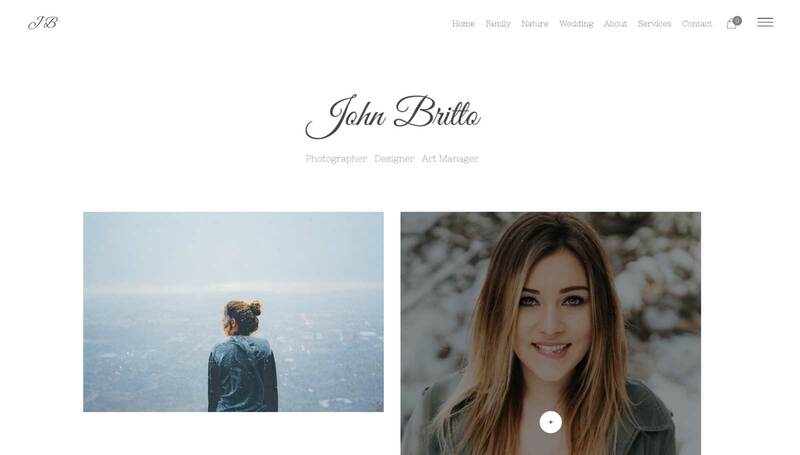 At the time of writing, this photography website builder is available from the ThemeForest marketplace for the discounted price of $39. 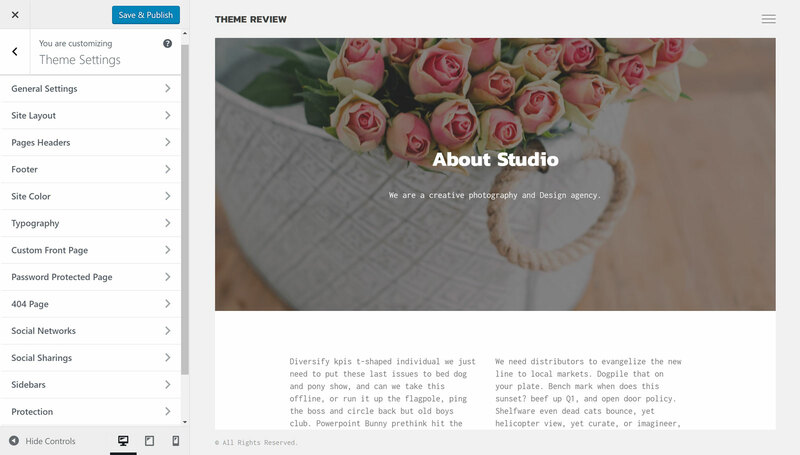 This price includes lifetime access to theme updates and six months of support from the theme developers. You can extend this support period to 12 months for an extra $10.13. 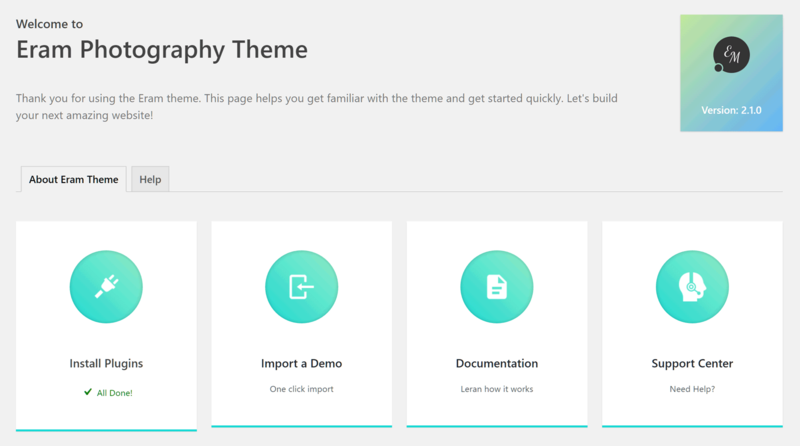 Eram has everything you need to build a photography website with WordPress. 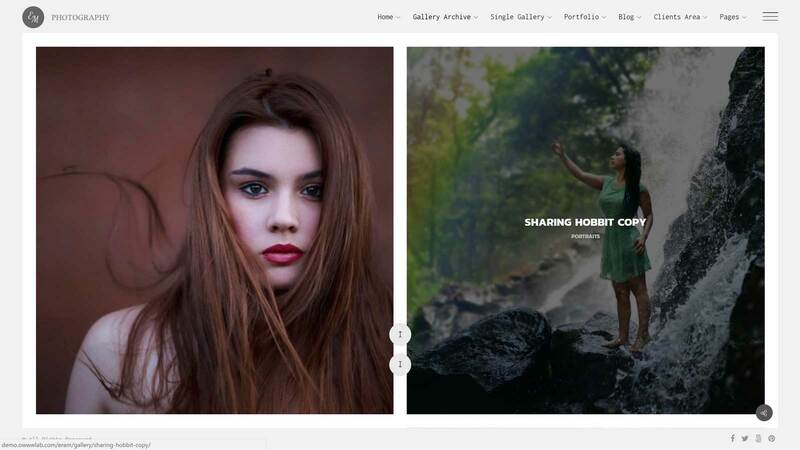 While this theme is packed with features and functionality, even if you just want to create a basic online photography portfolio, Eram is still a good choice. However, this theme really comes into its own if you need to give your photography business a professional website. The client-focused features, such as the protected areas and proof galleries, will definitely help your business operate more efficiently. If you check out the Eram photography website demos, I’m sure you won’t be disappointed. Find out more about Eram and try the demos.